The Champions Indoor Football league board of directors has imposed penalties against the Dodge City Law football team as result of them not following and adhering to the league operations manual and guidelines with regards to uploading video. As a result, the Dodge City Law will be stripped of two victories and thus changing their overall record from 9-2 to 7-4 heading into the final week of the regular season. The victories taken away from Dodge City’s record will not be awarded to any other CIF team nor will their teams record be changed. Champions Indoor Football league commissioner Ricky Bertz stated “While this situation was unfortunate and no one in the CIF including the Dodge City Law wanted this to be the final outcome, the board of directors decided that this was what was best for the league given the circumstances and how they related to all team members involved. 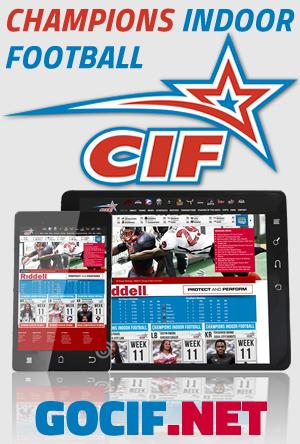 With a desire to maintain consistency on determining tiebreakers within the CIF, in the event that there is a situation where head to head games and strength of schedule are needed to determine who advances, the wins that where forfeited from Dodge City will still be used in the calculations”. The Champions Indoor Football league playoffs begin June 10th, and the final week of the regular season begins tonight between the Texas Revolution hosting the Wichita Force. The winner is guaranteed a spot in the playoffs and potentially a # 2 seed in the CIF’s southern conference. Be sure to watch all of the games as this promises to be an exciting finish of the 2017 regular season.